With the growth of online banking and mobile apps, nearly 50% of bank transactions occur outside of a traditional physical store. Boxman Studios recognizes this growth in the adoption of technology, but also understands the importance of convenience and customer service in the financial industry. With this in mind, we worked to create the pop-up branch, an innovative and community-oriented concept that can travel to different markets. 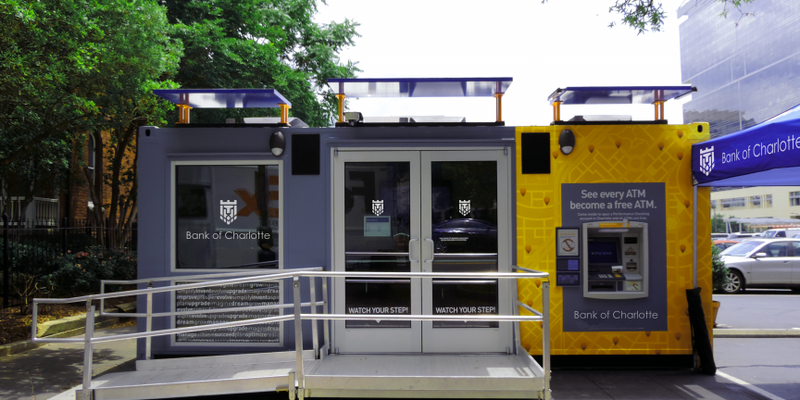 Designed with an efficient footprint, the 20’ x 8’ container environment houses many of the amenities of a full-service branch, including a 24-hour DepositEasysm ATM that can cash checks, deposit multiple checks or cash, and even dispense $1 bills. Customers can also open new accounts, order debit cards, or get information on loans and other products and services. Traditionally, when a brand needs to breach a market, they invest in expensive brick-and-mortar with a large staff, and operational costs. We believe there is more than one way to engage with their consumers. With that strategy in mind, this pop-up financial branch can be set up in high traffic areas, is easily accessible to community-members, and can move from market to market for high brand visibility and interaction.